Now upgraded with WiFi connectivity, the da Vinci Jr. 1.0w allows anyone to wirelessly send 3D files from their Windows and Mac computers to their 3D printer from anywhere in their local area network. No lines, no cable management, no worries! Don't let its slimmer and lighter look fool you, the da Vinci Jr. has a robust build size of 5.9 x 5.9 x 5.9 inches and a resolution of 100 to 400 microns! Its design allows for the inclusion of an auto-feeding filament system which takes the PLA filament to the extruder to ensure that the filament is loaded properly and is ready to print. The da Vinci Jr. 1.0w uses an intuitive 9-point calibration detection system that determines the distance between the extruder and the print bed. After it finishes detection, it adjusts the extruder accordingly to ensure that you have the best possible prints! The da Vinci Jr.w features a fluid, press-and-release extruder which makes for an easy extruder replacement or cleaning experience. 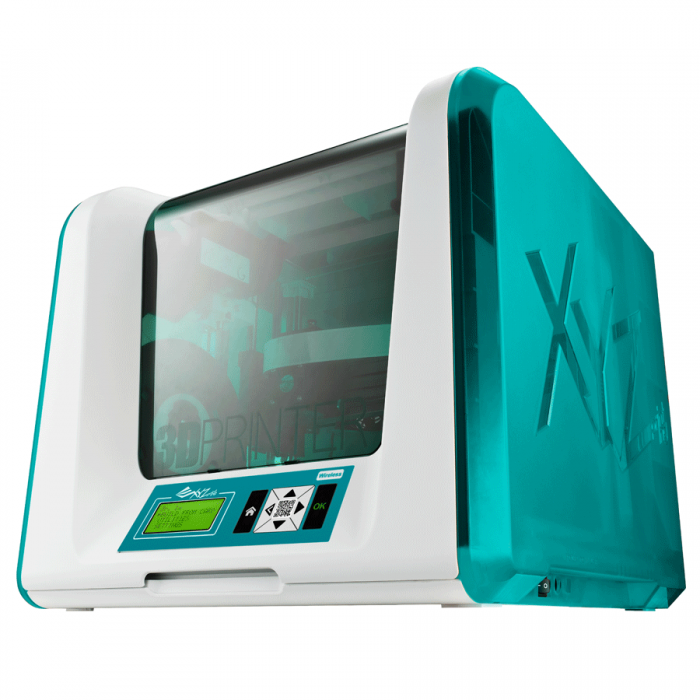 Simply open up your 3D printer, press the release button, and the replacement or cleaning process can be done within few seconds. The da Vinci Jr. 1.0w uses non-toxic, biodegradable PLA in easy-to-install filament spools so that you don't waste anything with your prints. With the da Vinci Jr. 1.0w's compact design only consumes 75 watts of power, making it an effortlessly green 3D printer. With its fully enclosed design and non-heated print bed, the da Vinci Jr.w is perfect for kids of all ages as well as first time 3D printer users. The 2nd Generation Auto-calibration system ensures that the print bed and extruder are always at the appropriate level for perfect prints, while the WiFi connectivity allows for print jobs can be sent from anywhere in your home and in the classroom.